While black may be a go-to in my closet, blue is actually my favorite color! I love all shades of blue, but my absolute favorite is a pale, ice-blue. While perusing the new arrivals on NET-A-PORTER, I happened upon this pretty printed silk-chiffon top by Band of Outsiders. It contains notes of pale blue, black, navy and white, making it easy to style with a bunch of different things. This top is ideal for the office tucked into a skirt or high-waisted trousers, perfect for date night with a cute jacket and pumps, and refined for casual daytime or weekend wear with shorts and sandals come summer. blue is one of my favorite colors as well and pale blue suits you so well. Now give me this blue moto jacket. Such a cute too! I especially love the top left look! Blue is a gorgeous color on you. It’s no wonder you love it so much! I wear entirely too much navy and I really need to branch out to this beautiful powder blue. Love this post – hope it’s a new series that will continue because there are so many great styling ideas here! hey hey I’m lovin this post! :) one top four ways is the best! 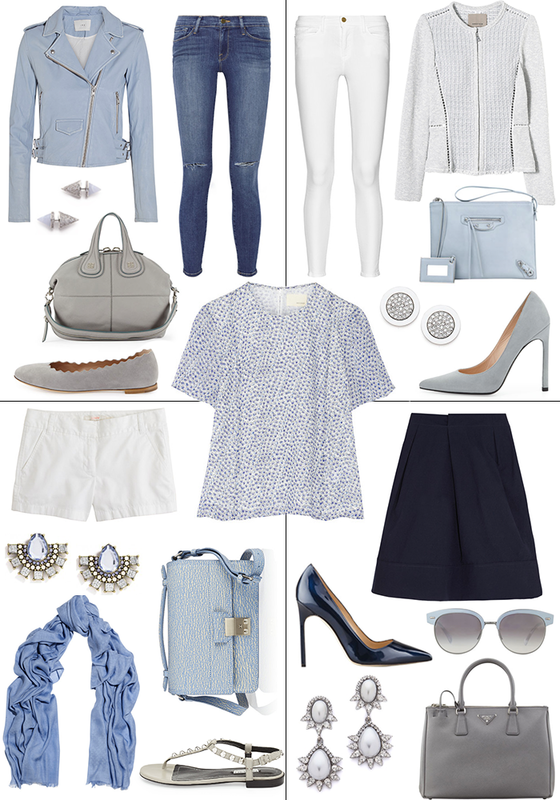 I seriously want every single item… especially that IRO jacket! Love these outfits so much – but I cant afford anything! I would love if you could post “similar” items at the bottoms that are more affordable! Clearly that top is the perfect top. So versatile and fab with a variety of looks. Great outfit ideas! Love the 4th look! SUCH a good post, Merritt! Great post, Merritt! What a good idea. I like the two style on the right best! Cute blazer and awesome skirt! Such a pretty top! Loving the look on the bottom right. That Prada tote and black patent heels are timeless and elegant!